By Thoriq Firdaus in Toolkit. Updated on November 19, 2017 . Dropbox is the leading platform to store, backup and share files through the cloud storage. You can drop your files in the Dropbox folder and it will be synced in minutes if you have shared it with others. 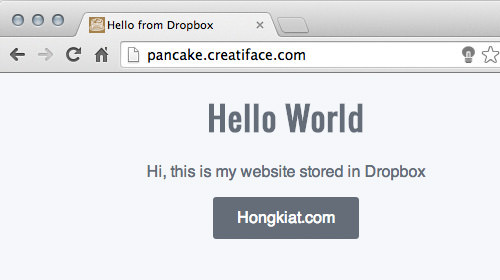 But, apart from file sharing, did you know that you can also host a website in Dropbox? Hosting your website in a free service like Dropbox is helpful if you have a budget that is too tight for you to find alternatives. And this made possible and easy with a web service called Pancake. 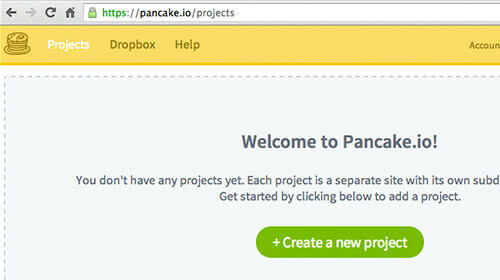 Pancake is a web service that allows you to serve the file with its *.pancakeapps.io subdomain and with your own domain. Sounds cool? Let’s check out how to do this. First, we need to create a Pancake account. To create one, enter your email address and set your password. Once the sign-up is completed, connect to your Dropbox account. Click the Connect Dropbox link in the menu bar to begin. It will redirect you to Dropbox. 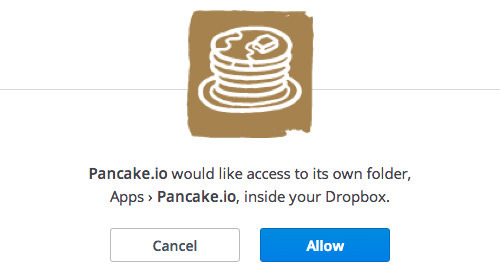 Then, sign-in to your account and allow Pancake.io to create a new folder, Apps > Pancake.io. I assume that you have your project prepared by now. Here is my sample website. I have created a very simple web page which only contains a heading, a paragraph, and a button. 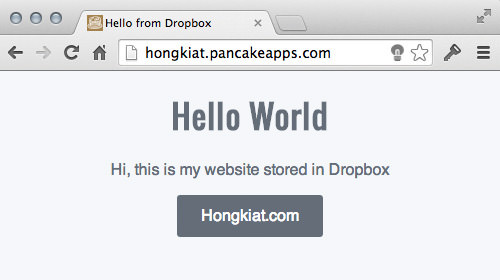 Drop your website within the Dropbox folder within the Apps > Pancake.io folder. Now we need to create a Pancake.io project. So head over to the Project page, and click on that big green button to start. Fill out the form – the Project Name and the subdomain. Note that the subdomain have to consist at least 5 characters. 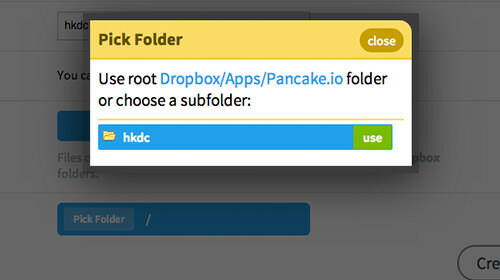 Then select your website folder from the Pancake.io folder in Dropbox. After that, click the “Create Dropbox Project” button. Now you can access your website via the subdomain that you have specified. As mentioned, you can also use your own domain name. 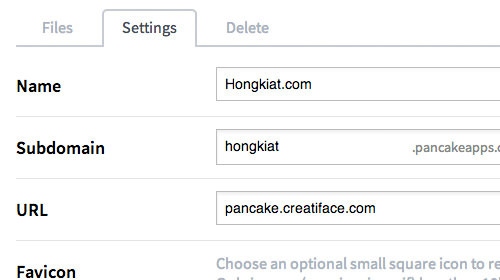 To do so, go to the Settings tab of your Pancake.io project and specify your domain name. In this example, I set it to pancake.creatiface.com. Then you need to create a CNAME record, pointing the domain that you have set in Pancake.io to the *.pancakeapps.io subdomain, like so. You have to wait for about 24 – 72 hours for these domains to propagate. Then you should be able to access your website with your own domain name. 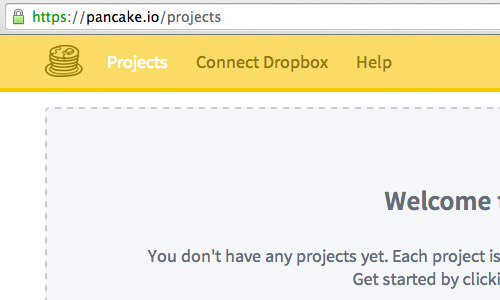 Pancake.io made publishing your own static website a piece of cake. 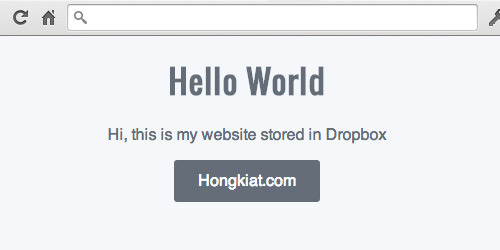 You can now simply drop your website in the Dropbox folder, and it will be up in seconds. No need for FTP-ing files anymore. In addition, you can create up to three projects with a single account.